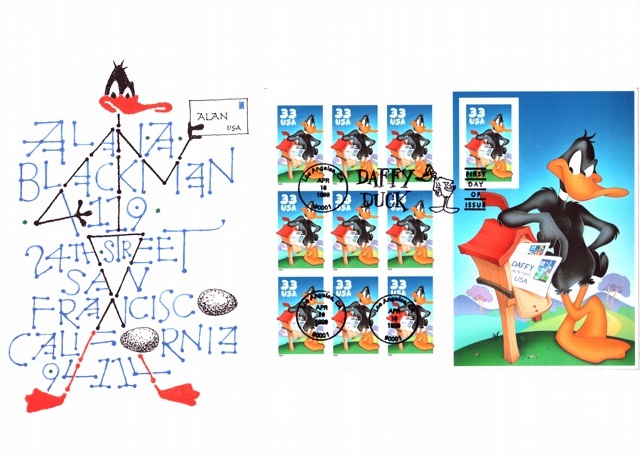 Alan Blackman has had a long and storied career, as an artist, calligrapher, typeface designer for Adobe, lettering arts instructor, and three years working for the U.S. Post Office at San Francisco’s Rincon Annex. By his own account, however, his most significant work is Letters to Myself. Letters to Myself was a personal project first undertaken by Blackman in 1968. 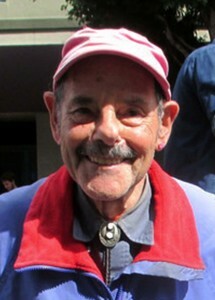 His then 11-year old son Stephen lived across the bay in Berkeley, east of San Francisco. 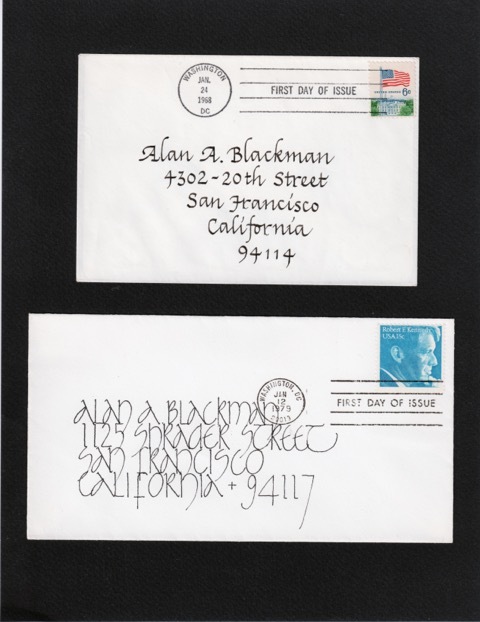 Through his work in the postal service, Blackman became familiar with “first day covers,” letters affixed with a stamp on its first day of release and mailed from the city from which the stamp originated. Each such letter is stamped with the cancellation FIRST DAY OF ISSUE, as well as the date and city of origin. For every letter that Blackman sent to his son, he sent a similar one to himself. 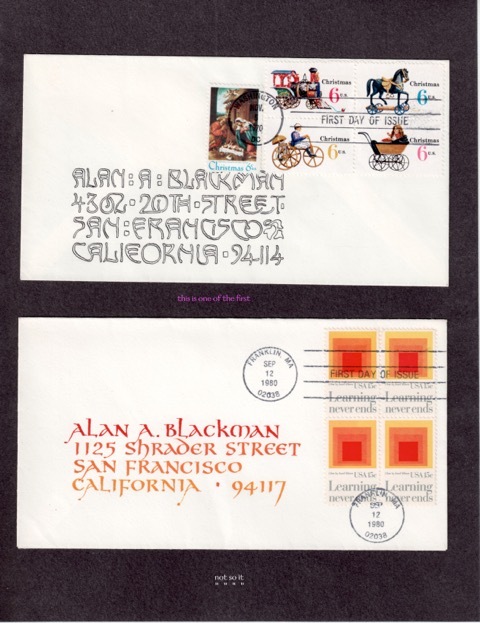 Using the stamp design as a starting point, he hand-addressed the letter in beautifully colored calligraphic design, each cover compatible or related to the design of the stamp. Over the years, his calligraphic envelopes became more elaborate and theme oriented. 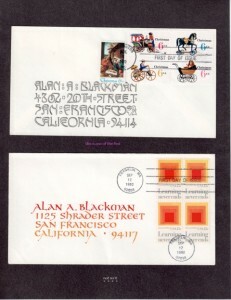 As a child, Alan Blackman was an avid stamp collector, an enthusiasm he shared with his brother. 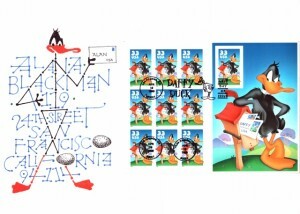 Growing up in rural New York State, they ordered stamps from around the world by mail, becoming familiar with remote and exotic place in the process, including Tannu Tuva, Bosnia-Herzegovina, Schleswig-Holstein, Sarawak, and St. Pierre and Miquelon. Through the letters project, he hoped to share the joy of receiving a personal letter in the mail, as well as his love of design and stamps, with his son. On a recent day, through a serendipitous encounter, I had the pleasure of having lunch with Alan and our mutual friend Ann. In describing him, the first word that comes to mind is “dapper.” He was wearing purple pants, a fuschia jacket, (which he readily admitted that he had purchased in the women’s department at North Face because of the color) and a moonstone earring in his left ear. He looked amazing. Upon visiting his website, I have come to know that Alan is equally comfortable in a tuxedo or jacket, bow tie and hat. The common theme to his apparel seems to be both artistic and colorful. interest in all things related to letter writing, including the new Elvis stamp scheduled for release in Memphis in August, Alan burst into song with a commendable rendition of one of Elvis Presley’s gospel songs. Alan Blackman’s work has been shown in museums and galleries. 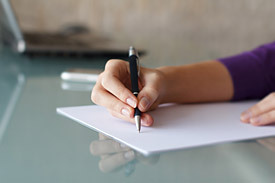 Most currently, Letters to Myself will be on display in the Jewett Gallery of the San Francisco Main Library, 100 Larkin Street, July 26 – Oct. 11, 2015. The exhibition is dedicated to the memory of his beloved son Stephen Blackman (1957 – 2012), born in Oxford, England, a noted TV cameraman, photographer and cinematographer whose work was in demand all over the world. This exhibition is presented by the Marjorie G. and Carl W. Stern Book Arts & Special Collections Center, home of the Richard Harrison Collection of Calligraphy and Lettering, where original calligraphic works by Alan Blackman may be found. 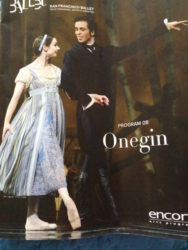 What a great piece! My father, grandfather and I all requested first day covers when I was growing up and this brought back fond memories. Ours were not so beautifully inscribed, however.